The new FatMax tape has a blade that automatically locks at the length to which it is extended. When the release button is depressed, the blade retracts. The auto-locking feature allows users to control tape retraction which helps to provide long blade life and reduce the risk of injury. The tape also features a manual mode, a setting used to override the auto-locking mechanism, enabling it to become a traditional retractable tape, by depressing the button and pulling back away from the hook. 25 Ft. length, 1.25 In. wide blade with 11 Ft. of standout for extra and easy to read graphics. Patented Blade Armor coating ensures maximum durability and reduced blade breakage. Exclusive cushion grip built into case for slip and impact resistance. Strong spring for smooth retraction. 33' / 8m. length, 1.25 In. wide blade with 11 Ft. of standout for extra and easy to read graphics. Patented Blade Armor coating ensures maximum durability and reduced blade breakage. Exclusive cushion grip built into case for slip and impact resistance. Strong spring for smooth retraction. A tried and true traditional Lufkin tape measure ideal for casual users and high volume professionals that demand quality at a value price. Classic chrome finish over a strong ABS case provides a long lasting durable measuring tape. Bright yellow blade with bold black and red markings is easy to read. 8 meter power tape has a lightweight yet high strength, closed case that is designed to fit perfectly in the hand. It also fits easily into most tape holsters. The orange plastic is easy to find on the job. The A30 style blade is Mylar<sup></sup> coated in bright yellow and has clear, easy to read numerals graduated in feet and inches to sixteenths on one edge and in meters to millimetres on the other. Continuous inches plus consecutive inch marks within each foot from the 1 foot mark. Truss marks every 19.2 inches. Fatmax 25 Feet. X 1-1/4 Inch. 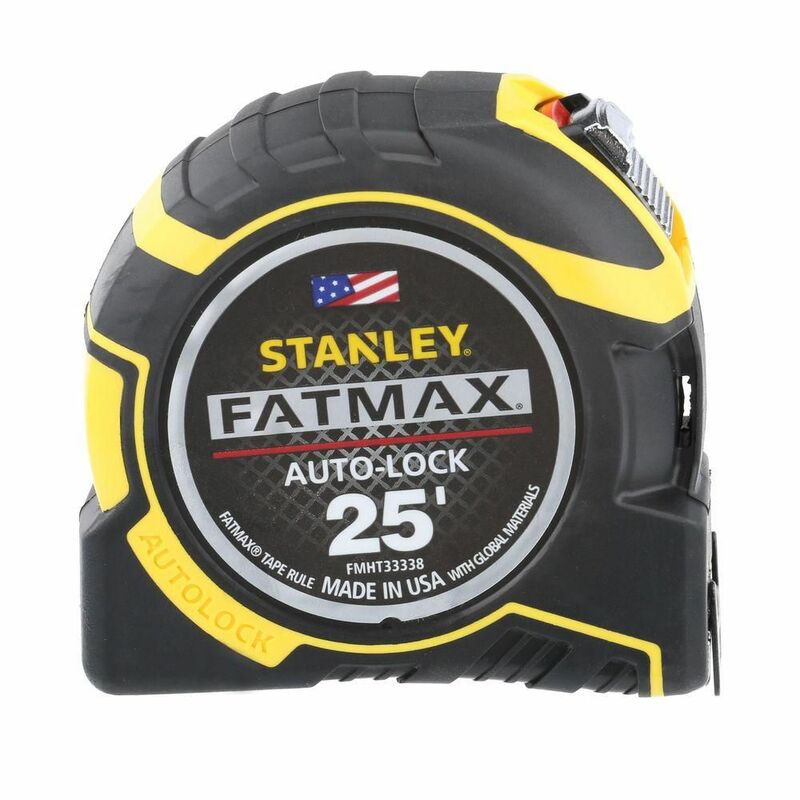 Autolock Tape Rule The new FatMax tape has a blade that automatically locks at the length to which it is extended. When the release button is depressed, the blade retracts. The auto-locking feature allows users to control tape retraction which helps to provide long blade life and reduce the risk of injury. The tape also features a manual mode, a setting used to override the auto-locking mechanism, enabling it to become a traditional retractable tape, by depressing the button and pulling back away from the hook. Fatmax 25 Feet. X 1-1/4 Inch. Autolock Tape Rule is rated 3.9 out of 5 by 373.